HUNTINGTON, W.Va. – Marshall University, in partnership with local nonprofit organizations and volunteers, will host its 15th Annual Empty Bowls fundraising event from 10:30 a.m. to 2:30 p.m. Friday, April 13, at First Presbyterian Church, 1015 5th Ave.
Community members are invited to the church to purchase bowls created by Marshall University art students and other volunteer potters from the Tri-State area. Bowls will be sold for $15 each, with proceeds going to the Facing Hunger Food Bank. With their purchase of a bowl, guests also can enjoy a bowl of soup, donated by local volunteers and restaurants, and participate in a silent auction, also benefiting the food bank. Cash and cards will be accepted at the event. So many groups contribute, she said. That includes the Marshall art students, as well as the Huntington Museum of Art, and community volunteers who help create bowls and provide the soup and bread, not to mention those who attend and purchase a bowl. Each $15 bowl represents 112.5 meals, Kirkhart said. 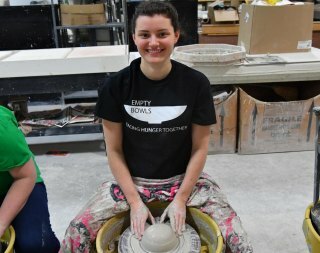 The class for which Marshall students create the bowls is about much more than pottery. It’s a community involvement class, said Frederick Bartolovic, associate professor of ceramics and organizer of the event. That visit to the food bank makes all the difference, students said. The visit to the food bank got student Kevin Trautwein excited about giving back. For more information about the event, contact Frederick Bartolovic at bartolovicf@marshall.eduor 304-696-2902.